When you summon a creature with 6 cost or more, both Luzrah and that creature gain +2/+2. 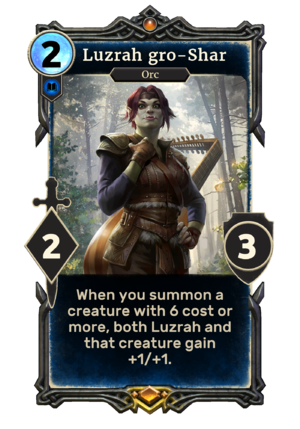 Luzrah gro-Shar is a unique legendary Intelligence creature card. It is part of the Isle of Madness story set. "La Da Da Di Daaa. No, that's not right." "La Da Di Da Da! Ugh... I'll get it yet!" This card's ability applies the Heroic Ballad card effect. As a female Orc, Luzrah's name doesn't follow the usual Orcish gender naming rules where "gro" is masculine and "gra" is feminine. It was revealed in an interview that when the error was caught, it was too late to fix the voice over involving her name.